On Halloween, I woke up at 3:45AM on two hours of sleep to get ready to head to the airport for our 6AM flight. 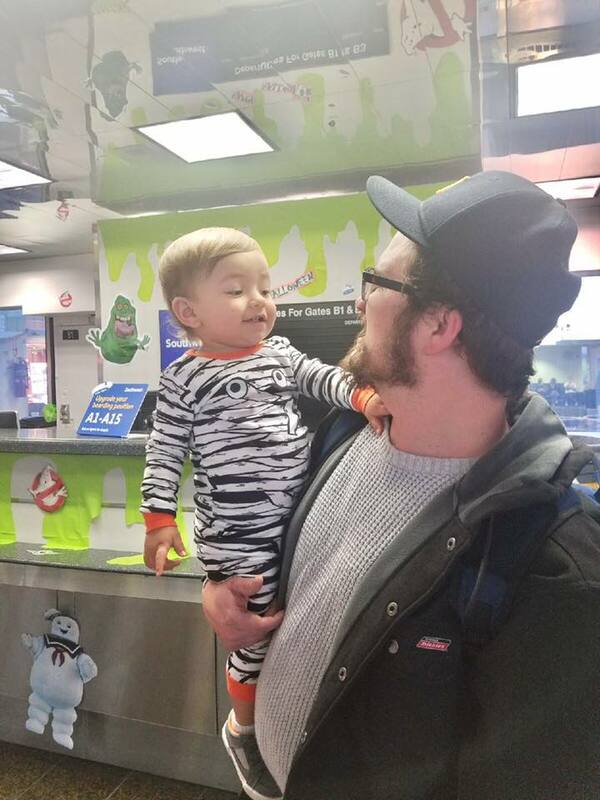 Due to our tardiness, confusion returning our rental car, long Spirit and TSA lines, we MISSED the flight and therefore missed out on some birthday and Halloween festivities. We were able to get on an afternoon flight but that meant none of us dressed up, S didn't go trick or treating, and I didn't get to pull off my Golden B-day plans I had for my husband. I selfishly spent most of the day upset about our circumstances. And then after we boarded our flight, to my surprise, the birthday boy my husband himself told me about candy he bought so Seb could trick or treat on the plane (Spirit wouldnt let him-- so instead Seb handed candy out to passengers as they deplaned). I quickly realized Halloween isn't about dressing up. And even Tim doesn't care about a potentially missed cake and decor so why should I? It's simply about being together on his birthday/favorite holiday and celebrating in whichever way we can, especially on a day like that day when such a scary, bad thing happened in our city. Being together and being okay is the most important thing of all. To my husband, I LOVE you. For being able to see the bigger picture, for being such a loving--and understanding-- husband, for being the best dad Sebastian could ever have, and for just being you. It's okay to be upset even though you knew the most important aspect was just being together. I would have been bummed too.